We NEED a world-class acute general hospital that is accessible to everyone in West Herts. Building a first class, clinically excellent hospital on a greenfield site, with free parking and easy public transport access, would be CHEAPER and could be completed YEARS BEFORE the proposals to patch up Watford. Our goal right now is to build broad public support across all the areas the local NHS commissioning group represents. 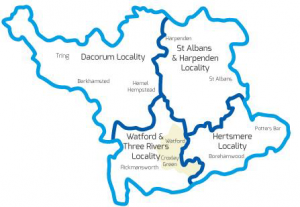 This is from Borehamwood to Tring, from Harpenden to Rickmansworth & Chorleywood and includes St Albans Watford & Hemel Hempstead. In order to shift the thinking of our local CCG and West Herts Hospital Trust we need YOUR HELP.